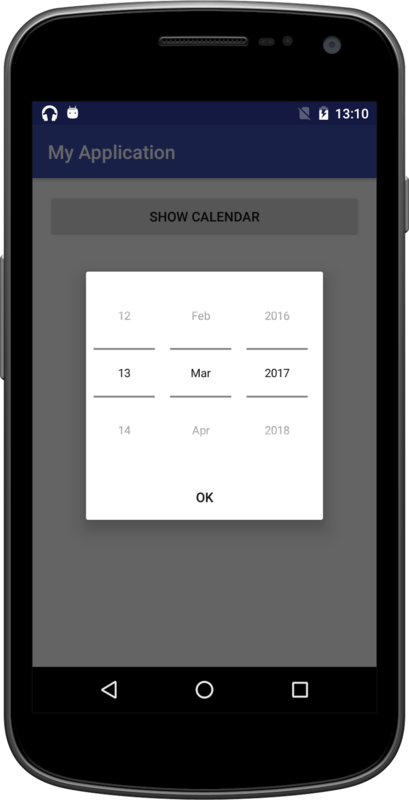 To use a DatePicker you can use DatePickerDialog. This can be created and shown programmatically too. The first parameter is the context. Second parameter is the class which implements the interface OnDateSetListener. Next three parameters are year, month (Jan is 0) and day of month. As we can see, we modified the class header added to the phrase "implements DatePickerDialog.OnDateSetListener " to it. The studio will prompt you to add the method onDateSet. 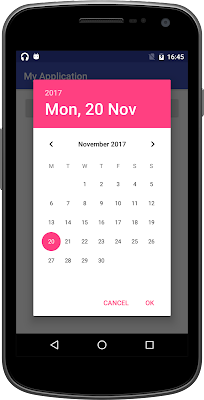 The last 3 parameters are selected year, month and day of the Datepicker. In this example, I am displaying this value in a textview. Calendar.getInstance() will return a calendar object with current date and time. You can modify it as shown by setting day, month and year fields. 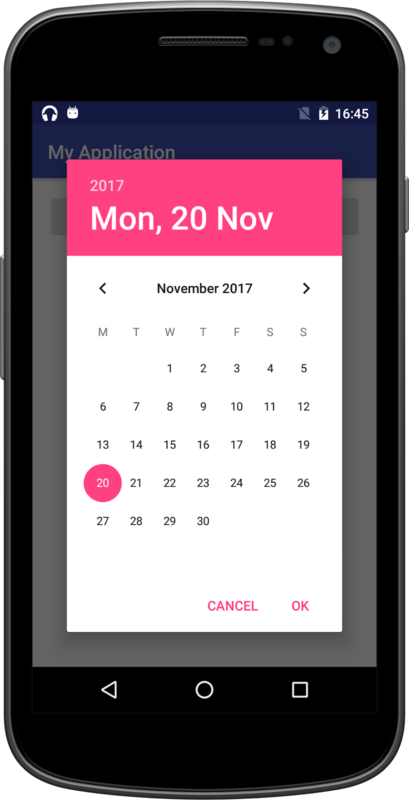 Note that we initialized the dialog with 2017,10,20 and the dialog shows 2017 November 20th. So keep in mind, month number starts with 0. Studio gives you a warning that these methods are deprecated. But unlike other deprecated methods, these methods actually do not work in sdk 21- Lollipop onwards. So the dialog still shows calendar instead of spinners. I tried various options. As far as I could find out, the only solution seems to be to use DatePicker in a normal dialog or a dialog fragment instead of a DatePickerDialog. Let us look at that. Look at the two highlighted lines. You can set datePickerMode to spinner or calendar. 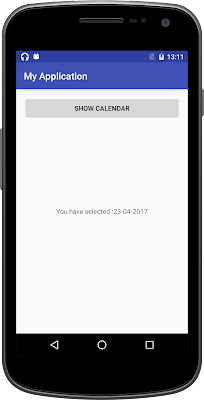 Even when you set to spinner, a calendar is also shown. To avoid that, set calendarviewshown as false. Now for the listeners! Funny, there is no dateset listener. Not so easily found at least. I tried documentation and trying to use autocomplete with setOnDateSet or addOnDateSet etc. No. They are not to be found. Finally the solution was found as init method. Datepicker should have an init method with initial values of dd, mm and yy and also the datesetlistener. Look at the pink highlighted line again. Studio adds the interface and the method like this. So that's it. Mission accomplished. We are able to show a date selector as a spinner.